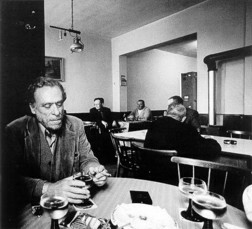 Ever since then, I've thought about my relationship to Bukowski's work, and have dabbled with imaginings about his ghost. I include one of these poems in "Monster Poems." Recently, I also uncovered a novel concept and first few chapters with the working (or not working) title "Better Safe Than Haunted by the Ghost of Charles Bukowski." Needs work, I reckon. But here's the first chapter for your reading enjoyment. If you'd like to read more, click that "Follow" link up at the top of this page. If I get a few of you to do so, I'll post chapter two. “Misery is the privilege that finds you when you need it to,” quips Charles, belting me across the face. My chin whips over my left shoulder, and I go down. Needless to say, nobody sees the blow that fells me. Conveniently for Charles, he’s non-corporeal. Annie gasps in surprise. My toppling is a far cry from the expected response to the question, "Do you take this woman to love, cherish, honor, obey, in sickness and in health, 'til death, yadda yadda…"
From my vantage point at carpet level I can see already where this is going, this ceremony, this afternoon, this evening, tomorrow and tomorrow and tomorrow. I can see it going a long way away. I lift my face up to the shoes of my Uncle Joe and Aunt Maddie who have come in from Cleveland. Cries of confusion and concern arise from all quarters. I postpone saying anything to anybody until it’s Annie, my dad and the pastor who are closest. “I can’t,” I say. They know what I mean. I see Annie’s dad has the message, too, but there’s this clinging we people do, denying what’s patently true because we want some explanation that will change the truth. I notice that Annie understands: her eyes are brimming. The pastor’s eyes are rolling, like he’s heard it all before and now he’s going to have to advocate for the rest of his fee. It’s my dad that’s desperate for words. Like a lost penguin, I walk quick, turning corners, seeking some way to home in on where I’m supposed to go. I keep turning so the people who will soon be leaving the church will not chance to drive past me. I don’t want the people who knew me to find me. I don’t want the people who thought they’d know me to tell me anything, either. I walk for at least an hour in the blasting Miami summer until I’m soaked through and God knows where. Charles appears for a moment to draw my attention to a shadowed doorway. “In here,” he rasps. The craggiest, most Caucasian man I’ve seen in Florida eyes me. The bartender looks ready to swing a haymaker at me. As I pound the beer, Charles swirls away into the stale effluvia of this place, and I move on to whiskey.